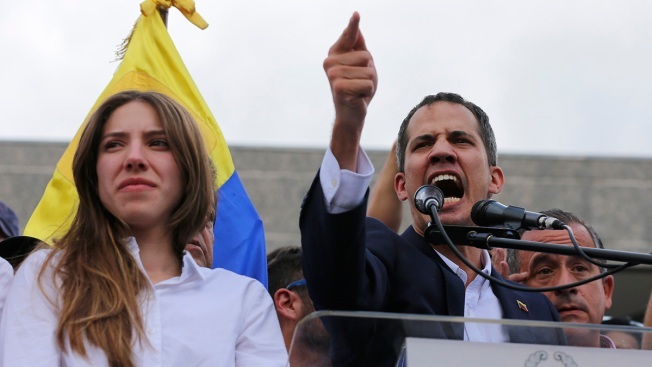 In this March 28, 2019, file photo, Venezuelan opposition leader Juan Guaidó, recognized by many members of the international community as the country's rightful interim ruler, speaks during a meeting with supporters after he was barred from public office for 15 years in Caracas, Venezuela. The International Federation of Red Cross and Red Crescent Societies said Friday that it is poised to deliver aid to Venezuela, warning that it will not accept any interference from President Nicolas Maduro or opposition leader Juan Guaido. Federation president Francesco Rocca said at a news conference in the capital of Caracas that the humanitarian network can start distributing assistance to an estimated 650,000 people in the South American country in around 15 days. The Red Cross "can never accept interference from other actors," Rocca added, saying that Venezuela was a deeply polarized country and it was vital that no one take advantage of the aid. On Twitter, however, Guaido almost immediately claimed credit for the effort, saying the announcement amounted to a victory for "our struggle." He also said medical aid would be coming into Venezuela in a matter of days, reiterating a promise that he was forced to renege on in February after security forces blocked U.S.-backed assistance from entering the country and clashed with protesters. Guaido said Venezuelans should stay vigilant to make sure incoming aid is not diverted for "corrupt" purposes, but did not expound on the logistics of aid shipments nor say whether any agreement had been made with Maduro to let them in. The leader of the opposition-controlled National Assembly has previously rejected the idea of negotiations with Maduro, saying his embattled adversary must resign immediately so that elections can be held. Early Friday evening, pro-Maduro demonstrators tried to block Guaido as he arrived in a vehicle to address a crowd in a Caracas neighborhood. 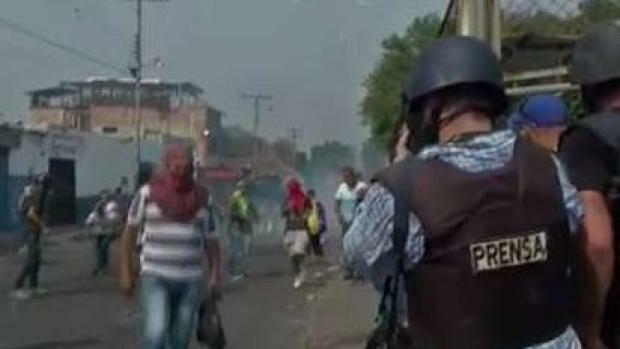 Police, who in the past have cracked down on opposition gatherings, set off a tear gas canister to disperse the government supporters and formed a line to separate the two groups. Maduro, who has previously denied that Venezuela was suffering a humanitarian crisis, did not immediately comment on the Red Cross initiative. A Chinese plane, meanwhile, arrived at the country's main airport, carrying what Venezuelan officials said was a 65-ton cargo of medical supplies. The plane was positioned near a plane that had brought Russian military personnel to Venezuela last weekend. The scene, and the timing of the aid arrival, projected symbolism for Maduro's government, which counts China and Russia among its allies but has been urged to give up power by the United States and dozens of other countries. The latest announcement comes as dire conditions in Venezuela force millions to leave the country and make lives elsewhere. Many who have stayed behind struggle to afford supplies of food and medicine, while nationwide power outages this month have exacerbated widespread misery. A new blackout struck Venezuela Friday evening, plunging much of the nation again into darkness. Netblocks, a non-government group based in Europe that monitors internet censorship, said the latest outage left just 10 percent of Venezuela's telecommunications infrastructure online. Rocca said he couldn't accept the idea of children dying because of a lack of electricity, and he said Red Cross workers would focus on the medical needs of hospitals, regardless of whether they are state-run or not. "The distribution has to be neutral," he said. Rocca added that the Red Cross would consider delivering aid currently being stored on the Colombian and Brazilian sides of the border with Venezuela, as long as it meets the protocols of the humanitarian organization. On Feb. 23, Guaido attempted to deliver that aid, much of which was provided by the United States in a direct challenge to the rule of Maduro. But Maduro said the shipments were part of a coup attempt against him, and armed forces blockaded the assistance. The U.S. has imposed sanctions on Venezuela's oil industry as well as individuals linked to Maduro in an attempt to force him from power, and it now leads many countries in supporting Guaido's claim that Maduro's re-election last year was rigged. In Washington, the U.S. envoy for Venezuela welcomed the latest aid distribution plan. "This looks like a real opportunity and we think it is a response to the efforts that interim president Guaido has been making," said the envoy, Elliott Abrams. Associated Press journalists Jorge Rueda and Matthew Lee contributed.